By the time spring is in full bloom, preschoolers are working hard on their letter formation skills. 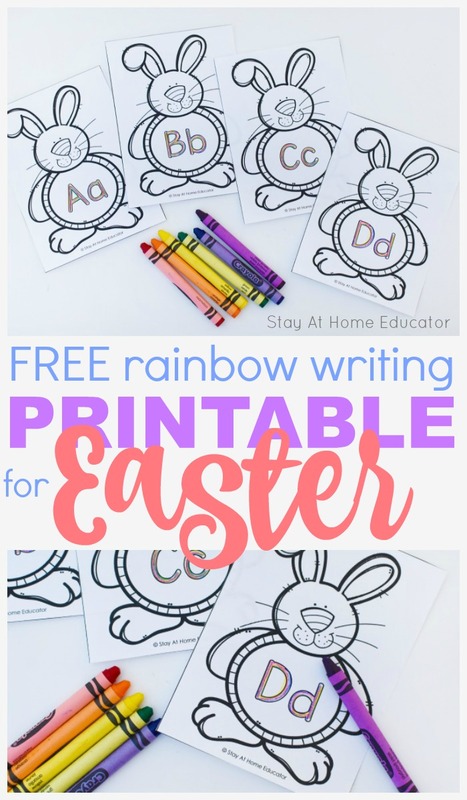 Use these free rainbow writing alphabet tracing cards for a little extra practice this Easter season. This post includes a free printable for Easter, so be sure to grab it from the end of this post. Rainbow writing has recently become one of my favorite ways to reinforce letter formation skills. This technique doesn’t have to be used with only tracing letters, but any tracing activity. 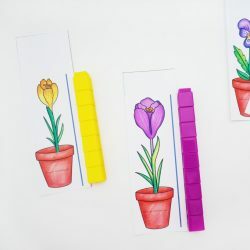 Basically, the task is to create a rainbow of colors as your preschoolers traces over the lines multiple times, using a difference colored pencil or crayon each time. This creates the rainbow effect, and the reasoning behind it is that is keep interest while practicing a single skill multiple times. You can use rainbow writing for any activity using pre-writing lines, or even for tracing shapes like in my Ants at a Picnic shape tracing activity. (It’s a free printable, too, so be sure to click here are grab your copy). But the reason I am loving the rainbow writing technique so much recently is because my preschoolers are so proud of their work now that they have a little more mastery with letter formation. 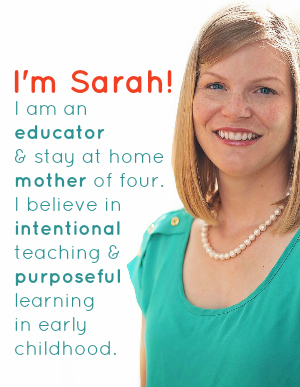 Since we are so far into the school year, the are better at letter identification and sounds, so practicing letter formation is more meaningful to them now. 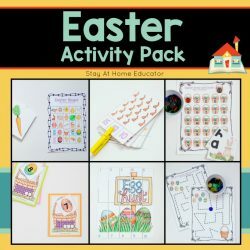 Not every preschooler has a huge interest in tracing letters, and that’s ok. Below the activity I give several ways to make accommodations so you can use this free Easter printable to meet the needs of all your preschoolers, even those not interested in writing. I think these little bunnies are so cute. Their bellies are so big and chubby! Just the right size for a letter or two. You don’t need much for rainbow writing, but I do have a few recommendations for the few materials needed. Which Writing Utensil is Best? When teaching writing, especially letter formation and not other pre-writing skills, the writing utensil you offer is important. If your preschooler already has a mature pencil grasp by using a tripod or quadrupod grasp, then use colored pencils. If your preschooler is still has an immature pencil grasp, then use crayons. And if your preschooler is really struggling with developing any kind of pincer grasp while using writing utensils, then I recommend these crayon rocks . They my favorite tools for helping my preschoolers develop the right pencil grasp. When introducing a letter formation or tracing activity like this one, it’s always best to just start with a few letters rather than scattering all 26 letters on the table in front of them. I find this is really important in keeping your preschooler form becoming overwhelmed with the task, especially if we are offering tracing activities. The other advantage to offering only a few letters at a time if that doing so will help keep your preschooler from writing fatigue. For most preschoolers, even if they have a mature pencil grasp, the physical act of writing requires a lot of hand strength and just like working any other muscle, working it for too hard or too long results in muscle fatigue. So offer only a few letters at a time, or allow your preschooler to practice letter tracing only as long as they are interested. Offer your preschooler a set of crayons or other writing utensil in a set of rainbow colors. 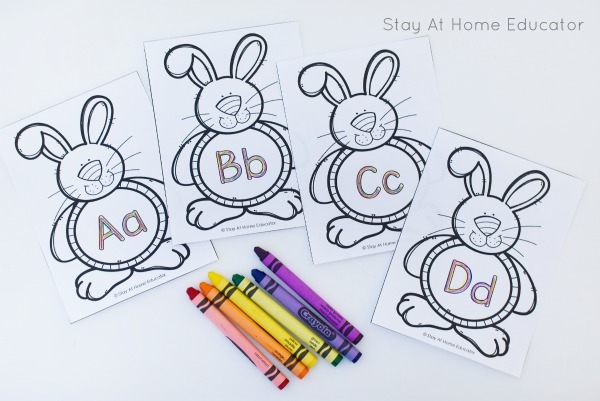 Invite your preschooler to choose a color and trace the letter on the Easter Bunny’s belly. It doesn’t matter what order they use their colors in, so long as they use each color at least once. After your preschooler has used all six colors on a single letter, it will look like the photo above. Your preschooler might also choose to keep practicing the same letter more than six times, using some colors multiple times. This is ok, too, as the extra writing practice should be encouraged, especially if it is practice your preschooler is choosing to do! 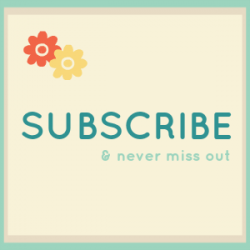 Don’t forget to grab a copy of your printable at the end of this post. 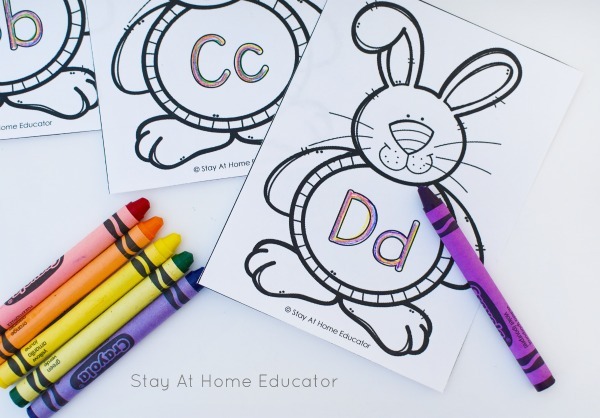 These rainbow writing tracing cards are all completely in black and white which means your preschooler can also color the bunnies. This is good pencil work for them, but I used it as a reward for my little boys finishing each letter. If they traced the letters on the card in their rainbow colors they then got the reward of being able to color the bunny, too. Although, admittedly, my youngest didn’t care about coloring the Easter Bunny as he was more interested in finding and tracing all the letters he knew. Don’t stop with just rainbow writing. 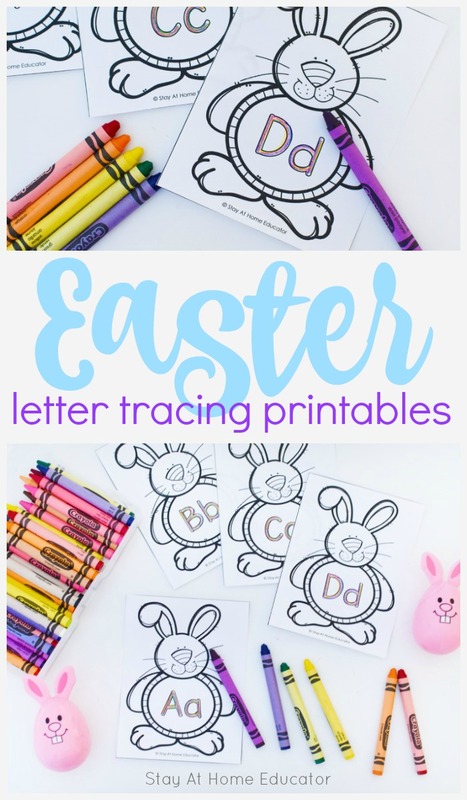 These Easter alphabet tracing cards can do a lot more than that! Try out some of these ideas below. 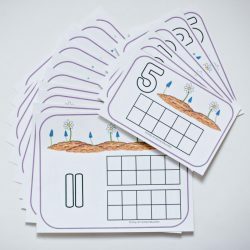 Use these cards as daily alphabet cards in April to go along with your regular phonics lesson plans. You can enlarge them on a photo copier. Spell out sight words, CVC words, or names with these cards. 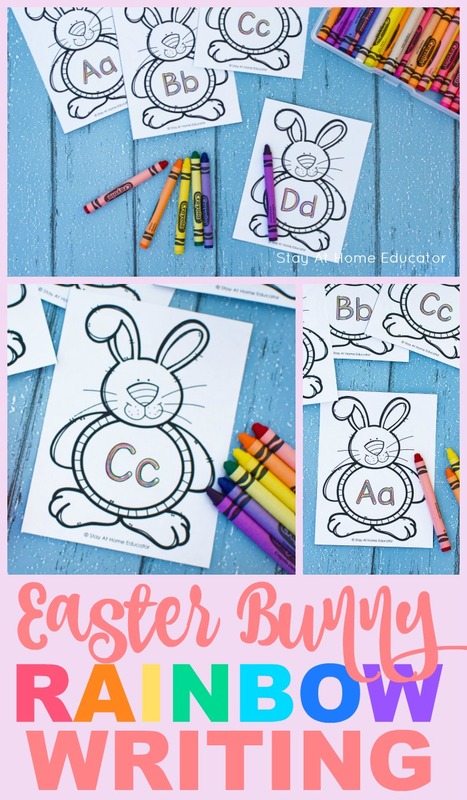 Print an extra set of these cards on colored printer paper and invite your younger preschoolers to sort the Easter Bunnies by color. 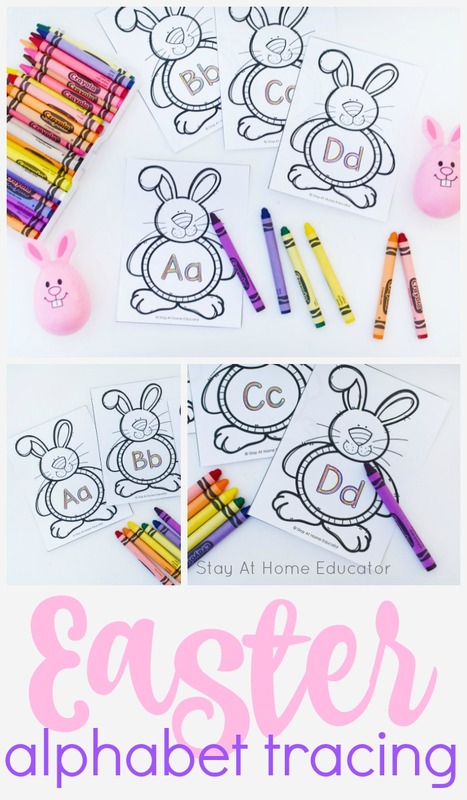 After the bunnies are all traced and colored, hang them up in the classroom and have your preschoolers point to each letter as they since the alphabet song. Or invite your preschoolers to find objects in the classroom with beginning sounds that correspond to the letter. 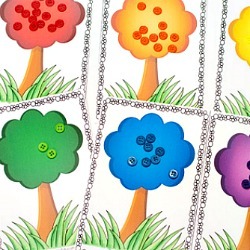 Laminate the cards and invite younger preschoolers to finger trace the letter. Or use glitter glue to create a “sand paper” sort of texture. Looking for More Easter and Spring Theme Printables? 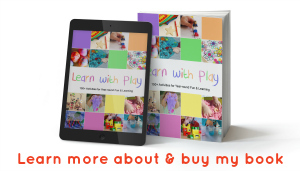 Check out these free printable for preschoolers. 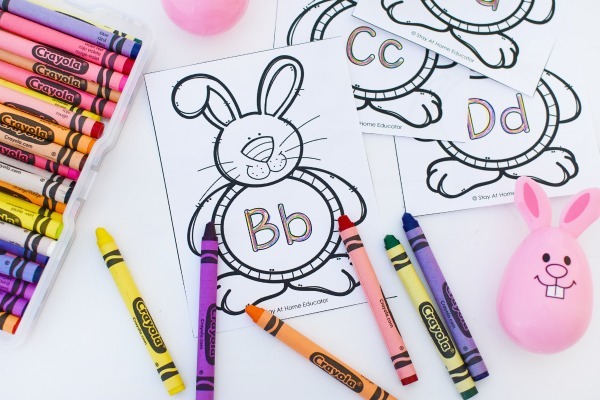 And your FREE Easter Bunny Rainbow Writing Alphabet Tracing Cards are available below! 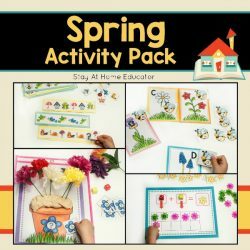 Or, try these activity packs. They are perfect for your Easter and Spring preschool centers. 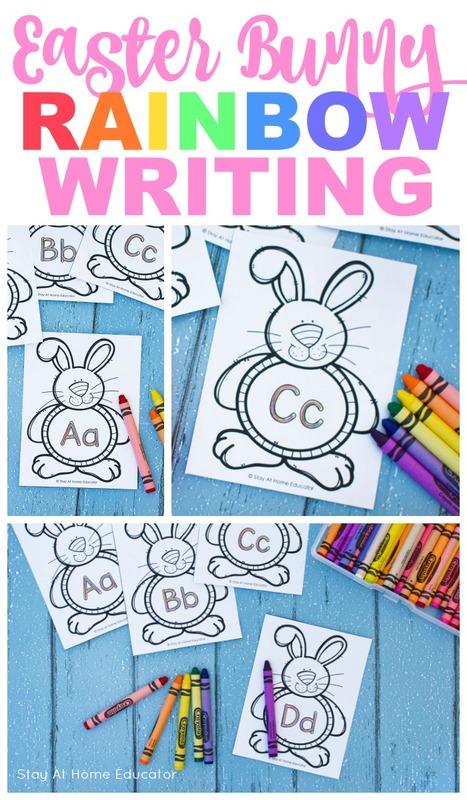 Your FREE Easter Bunny Rainbow Writing Alphabet Tracing Cards are right below! 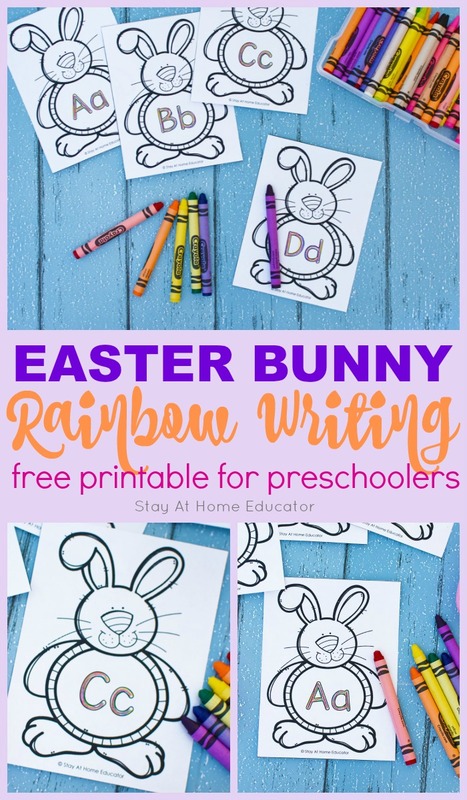 Want These Easter Bunny Rainbow Writing Cards? They are too fun! Grab your free copy by clicking the image below.